Fake followers on social media accounts clutter your stream, reduce your engagement, expose you (and your legitimate followers) to phishing or spam and put you at risk for having your account deleted. And fake followers can’t buy your product or service! 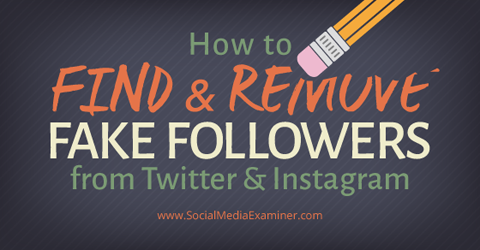 Discover how to find and remove fake followers on Instagram and Twitter. The only purpose for fake accounts is spamming or, in the case of fake accounts that were bought, pumping up someone’s reputation. Does someone you follow seem to have a suspiciously high number of followers? You can use these tools to check their accounts, too. The folks at Status People developed the Fakers app to check fake and empty Twitter accounts. 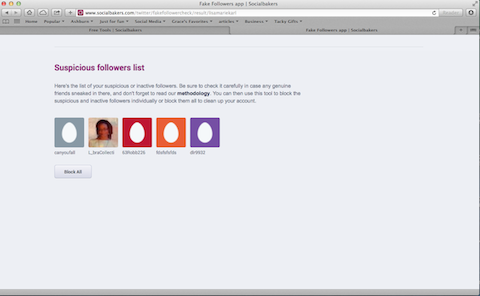 This tool allows you to easily see how many fake or empty accounts follow you, as well as check on the competition. On the Status People website, click Connect to Twitter to begin. You’ll need to authorize the app to access your Twitter account. In less than a minute (for smaller accounts) or up to a few minutes (for larger accounts), you’ll be able to see your own follower report. My Fakers app report on January 29, 2015. According to the Fakers app, 6% of my followers are fake, and 30% are inactive. Status People’s definition of a spam account is one that has few or no followers, has little activity and yet follows a massive number of accounts. 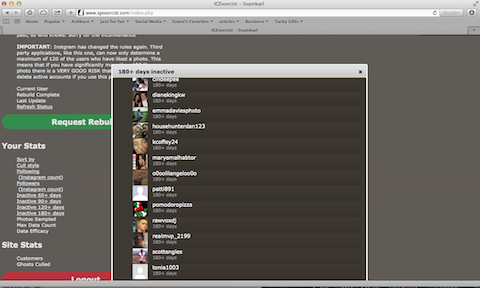 The report also lets you view a few details about your followers. Status People offers some details about your followers. For example, nearly all of my followers speak English, a quarter of them haven’t tweeted in a while and a quarter of them follow fewer than 250 people. The report even shows the Twitter handles of some of my fake followers. The free account allows for unlimited checks on your Twitter handle, plus eight free searches for friends or competitors, and the basic analytics I mentioned above. 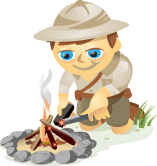 The basic account adds unlimited searches and advanced analytics. It also allows you to manually block fake accounts and track up to five friends. With the premium account, you can auto-block fake accounts and track up to 15 friends. 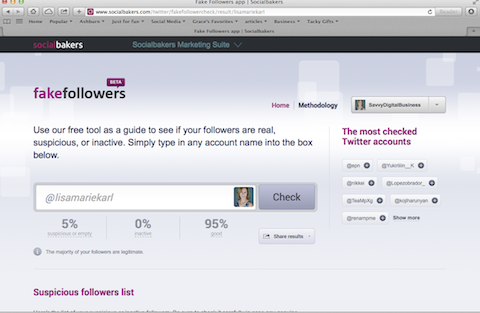 Fakefollowers is one of the free tools at Socialbakers, the social analytics company. This tool will check a random sample of 100 of your followers against a list of criteria, including follower-to-following ratio, red flag (spammy) words, a high percentage of tweets that are retweets or links and more. An account is defined as inactive if it hasn’t tweeted in the past 90 days or sent fewer than three tweets. To get started, type in your Twitter handle—or the handle of someone you’re curious about—and click Check. After you grant access to your Twitter account, you can view an analysis of your Twitter followers. My fakefollowers report on January 29, 2015. 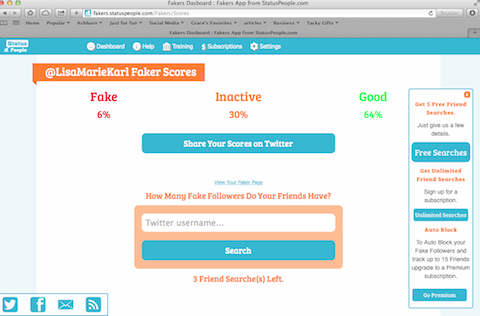 Fakefollowers reports that 95% of my followers are good and 5% are suspicious or empty. The report will also let you see some of the suspicious/empty accounts identified during the scan. You can block those accounts by clicking the Block All button. Some suspicious accounts that follow me. 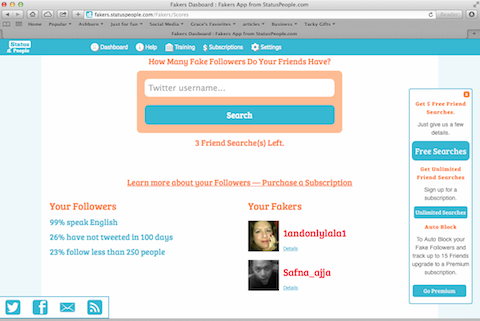 Fakefollowers is free to use. You can check up to 10 times a day, which is recommended if you have a large following. Socialbakers puts their margin of error (the only company that provided this information) at 10-15%. 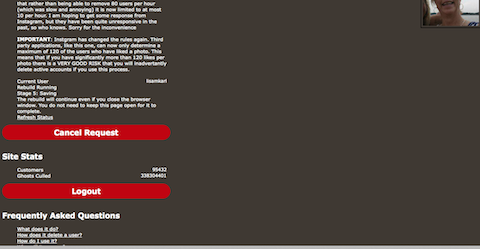 TwitterAudit is a tool developed by Dave Caplan and David Gross. It works by taking a random sample of 5,000 followers from the Twitter account (making it great for large accounts) and assigns a score to each follower based on the ratio of followers to following, the number of tweets and the date of the last tweet from the account. To use TwitterAudit, type in any screen name in the search box and click Audit. 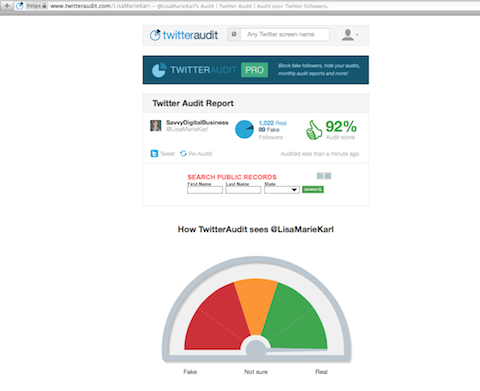 After you authorize access to your Twitter account, click Run an Audit to see your results. My TwitterAudit report on January 29, 2015. As you can see in the report, TwitterAudit gave me an audit score of 92%. The audit score is the number of my real followers divided by my total followers. The scan determined that 89 of my followers are fake. 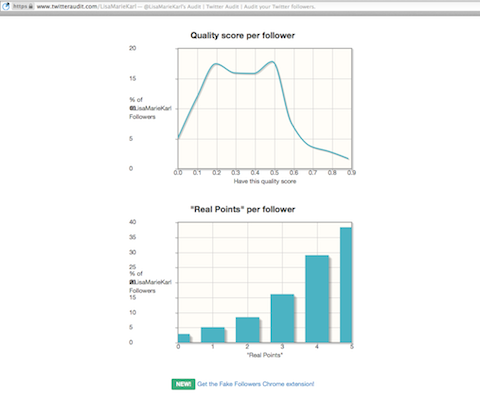 The quality score and real points of my followers. The free version of TwitterAudit provides your score. When the pro version is eventually released, it will also let you hide your audit, block followers and re-audit your account at any time. If you want to be notified when the pro version is available, click the TwitterAudit Pro banner near the top of the page and enter your email address. Developed by Michael Landers, IGExorcist allows you to check for ghost followers on Instagram, which are the inactive or spam accounts that follow you. It works by cross-checking your followers against accounts you’re following to gauge interaction over the past 300 days. Sign into your Instagram account from the IGExorcist website, then grant permissions and then click the Request Rebuild button. You’ll now be able to view a list of users who are inactive with you. However, because IGExorcist is so thorough—checking all of your followers—it can take a few minutes for a request to begin processing, especially if other requests are already in the queue. My IGExorcist results on February 2, 2015. The main criteria for removal is when people are following you and you aren’t following them, and they haven’t liked or commented on a photo in the past 300 days. The app doesn’t remove people you’re following. If you want, you can bulk delete any of the users identified as inactive with you. The process takes about 2-3 seconds per follower. The default setting is to remove all of the followers identified, but you can protect a user by clicking on his or her picture. Instagram users who haven’t interacted with me recently. Keep in mind the app doesn’t know when someone started following you. If someone just started following you and hasn’t yet interacted, their account will show up as inactive. IGExorcist is free to use, and the developer accepts voluntary contributions. Not all accounts flagged by these tools are fake, so be sure to check out the accounts slated for deletion before hitting the go button. Some empty accounts could merely be people who have a Twitter account to follow news and sports, for example. What has been your experience with fake followers? Have you used one of these tools? Were you surprised at the results? Please leave your comments below.